President Trump has suggested a tariff be placed on imported steel and aluminum. This has sparked a lot of debate about price raises of many items both domestic and import. This is what I think will happen. How will tariffs affect fitness equipment? Most American fitness companies use American-made steel. While we use American-made steel, the overall steel market in the US is dependent on imported steel. I spoke to several of our steel suppliers today and the general consensuses is that steel prices are headed up. Don’t run off and buy the store dry yet though. Steel prices are just one aspect of this. How are fitness products priced? Steel is only a small part of the general pricing of equipment. Breaking down the cost of a typical piece of equipment from most impact to least: shipping, labor, raw materials, equipment, and consumables. Shipping is including box creation, supplies, labor packaging, as well as actual cost of shipping. Consumables include things such as welding wire, paint, cutting blades/disc/tips, gas, and utilities. Advertising budgets can range from as little as 10% to over 50% percent. The price of steel is usually only 10% to 18% of the total cost of a product. A 25% increase in the price of steel will only result in a $25 to $35 increase in the price of a typical $1000 dollar piece of equipment. Expect a widening gap between domestic and import equipment. The formula for equipment cost is not the same in the United States as it is in other countries. I’m going to pick on Chinese-made equipment now. 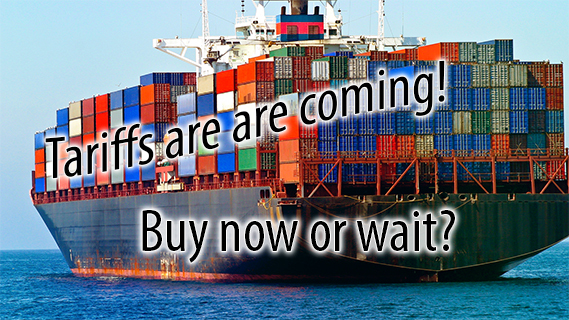 When dealing with Chinese import, shipping (or container cost), is usually your greatest expense. Shipping in this regard still reigns supreme. Labor on the other hand is almost a non-factor. Price of materials becomes a much greater part of the overall pricing. As America starts to depend less on imported steel there will be more of it available in the countries that produce fitness equipment. Equipment made in China, for instance, will become less expensive to produce. We are likely going to see a widening gap in the price of domestic equipment vs import. This widening gap will likely extend past fitness equipment in to other markets.